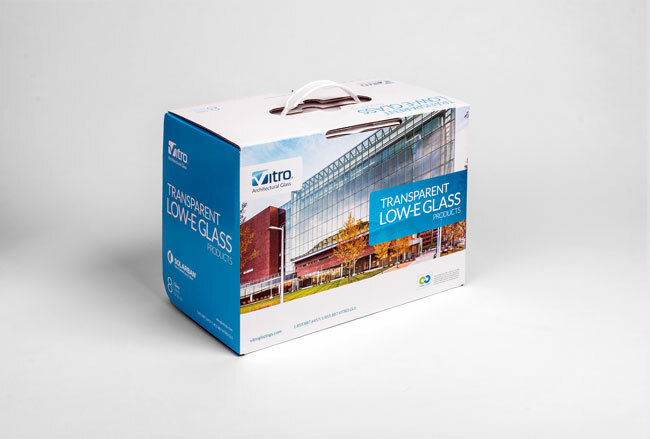 Vitro Architectural Glass (formerly PPG Glass) announced that two new glass sample kits, featuring 10 samples each of transparent and tinted low-emissivity (low-e) glass, can now be ordered through its online literature and fulfillment center. The transparent low-e glass kit contains insulating glass units (IGUs) with Solarban® 60, Solarban70XL, Solarban 67, Solarban R100 and Solarban 90 coatings on clear, Acuity™ low-iron andStarphire Ultra-Clear® glass substrates. The tinted low-e kit holds IGUs with multiple Vitro Glass performance tinted-substrates finished with various Solarban solar control low-e coatings. They include Atlantica®, Azuria®, Optiblue®,Optigray®, Pacifica®, Solarblue®, Solarbronze® and Solargray® glasses. Each glass sample is labeled with comprehensive performance data, including visible light transmittance (VLT), solar heat gain coefficient (SHGC), U-value, interior and exterior reflectance, and more. Robert J. Struble, manager, brand and communications, Vitro Architectural Glass, said that whenSolarban glasses are united with clear, low-iron and tinted glasses by Vitro Glass, they offer architects the industry’s most expansive collection of aesthetic and performance options. “These kits highlight only a fraction of the possible substrate-and-coating options available from Vitro Glass, but they are ‘must-haves’ for architect libraries that thrive on having the latest design and specification materials,” he explained.